How do you keep a flamingo flock safe in a major storm? 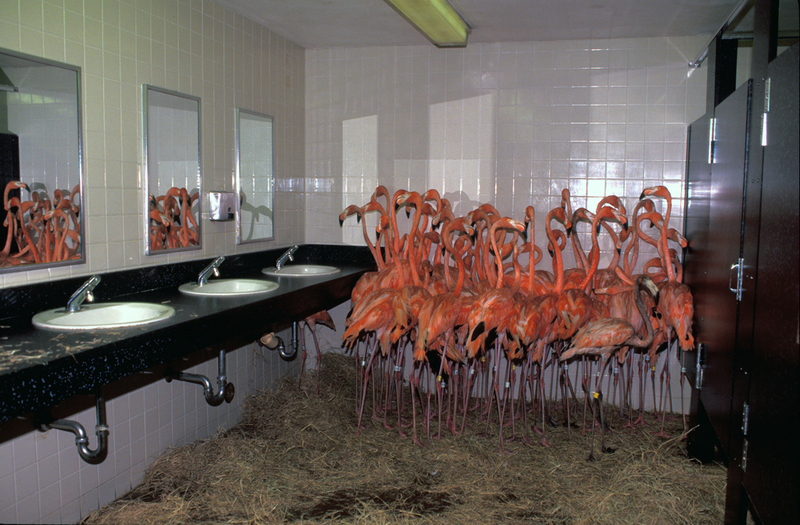 This past weekend, many Americans got ready for Hermine, but odds are that very few people had to stuff 30 flamingos in the bathroom of the Miami Metrozoo. Back in 1992, in the leadup to Hurricane Andrew, Ron Magill, the Miami Zoo’s assistant curator, had to help get an entire zoo ready for disaster. He says now, “I thought we were doing all this for nothing.” But he and his team ran around doing what they could, making sure all of their furry, feathery and scaly charges were securely housed and fed. Some of the bird exhibits weren’t likely to live up to the task. Most days, the flamingos loved being outside, sunning themselves in their outdoor lake. As soon as they were sure Andrew would make landfall, Magill and the other keepers looked for somewhere else to put them. The bathroom was the obvious choice—no windows, a tile floor for easy cleanup, and plenty of room for an improvised bed, made out of hay hastily dumped all over the floor. Most importantly, Magill adds, “it had a ready-made supply of fresh water.” He and his coworkers opened up all the stalls, made sure the toilets were full, and set out for the flamingo exhibit to grab the new tenants. But the team managed the job, and as they left the bathroom, Magill turned back for a moment to appreciate their work. He had always been a photography buff, and liked to carry a point-and-shoot wherever he went, even to emergency zoo batten-downs. “I look at all these flamingos and I go, you know, I don’t think I’ve ever seen anything like that before,” he remembers. He took a few snaps and got back to work. Hurricane Andrew turned out to be a big deal after all. “The storm punished the zoo from one end to the other,” the West Palm Beach Post reported at the time. “The restaurant fell apart; paddle boats that people rented to relax on the lake were thrown hither and yon.” An impala, an ostrich, and a dikdik were killed. The koala barn collapsed. One of the aviaries was completely leveled, releasing hundreds of birds—which, luckily, stayed close to home. Overall, it was the state’s costliest disaster ever, killing 44 people and destroying over 700,000 homes. “It looks like a war zone,” said Florida’s Lieutenant Governor, Buddy McKay, after flying over the affected area. Across the country, journalists were looking for new ways to get the extent of the devastation across. “Everyone was saying, ‘Does anybody have anything different than your basic stuff—trees down, roofs off and people with their bathtubs in the front yard? '” remembers Magill. 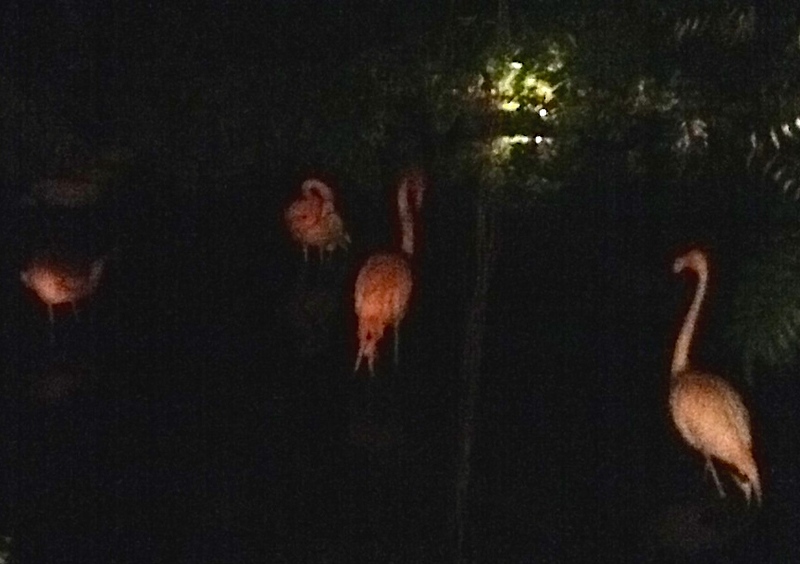 He sent out his bemused flamingos. The image was picked up by local newspapers and, soon, national ones, and the birds became the feathery face of the storm. 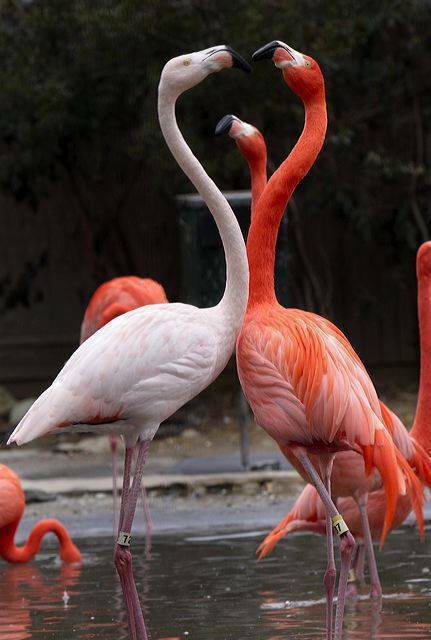 As for the flamingos, the whole flock survived their two-day bathroom ordeal. After a short stint at nearby Busch Gardens, they eventually made it back to a rebuilt exhibit, with no strange mirrors, and much larger, unflushable ponds. was in managing her flamingo.